Wanting to hire a fantastic team of people that spell S-U-C-C-E-S-S for your brand? Here is our ‘cut out and keep’ guide to hiring promotional staff. It is event staff that will make (or break!) your brand at an event, as well as how successful or not your event will be. If you are a brand with a customer demographic of young, hip and trendy 20-somethings, then that is who you need to hire. HINT- this isn’t about looks in terms of beauty but looks in terms of the event staff ‘matching’ with your brand and products. There are many promotional staffing agencies, some of whom supply staff for niches markets, others who are very general and fulfil all kinds of events and others that are well-established with a huge database of people. Ask around – who has heard of great promotional staffing agencies? What services do they offer? 3 – How else can an agency help? Event planning and organising takes a lot of time, effort, skill, money and resources – and know-how. sometimes, it is this ‘insider’ know-how that is lacking, the ‘been there, made that mistake’ kind of knowledge. And you will find that working with a great agency will see you tap into a bottomless reserve of information and inside knowledge. Promotional staffing agencies do more than just supply sales staff – they can sometimes have some pretty skilled people on their books, offering the specialist services you need. There are very few brands who hand over the reins of an event completely to a professional event team. Thus, this means that hired temporary event staff will work alongside your established team. It makes sense that your hired specialists will need to work well with your colleagues and so yes, this is an important consideration. And this means understanding what your goals and objectives are of either attending an event or hosting an event. 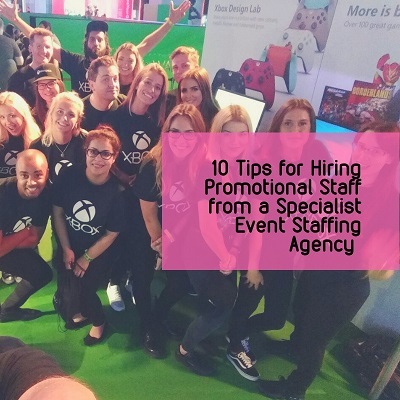 Without understanding why you are at an event, you can’t be specific about the skills you need from the promotional staff team you are hiring. Great! You have hired a sales team but… they don’t have any experience in your industry or sector – so how will that work out? Probably not as well as what you need it to. Again, this is about being specific with your chosen professional staffing agency. They may be only with you a short time but this is no excuse for not getting to know the staff you have hired. Some clients prepare a small induction pack, with information event staff need from the practicalities of how their time is to run as well as product and brand information. We shouldn’t have to spell this out but events are gruelling tests of stamina and so you need the right people with the right attitude. Skilled people who can deliver what you need to make your next event a rip-roaring success will come at a cost. Frankly, if it all seems too cheap, there is something not right. What is it you are getting for your money? Before you approach a promotional staffing agency, do your research about your event, what people attending expect, what a promotional staffing agency offers in terms of event services and more.